Half marathon #19 and race #55. One of the toughest race conditions I've experienced. While it was not raining when we got there, it rained the majority of the race with the exception of a couple miles. A tough course that was very hilly but a beautiful course. The fall color was not peak but I can imagine it would be incredible had it peaked that weekend. Registration was very simple as the race company, Endurance Evolution, had a very nice website set up where you could register and had information for each race they do. The layout of the website makes it very easy to navigate through the information. In addition, the company sent out regular email updates with information along with an athlete guide which was very informative - great communication! 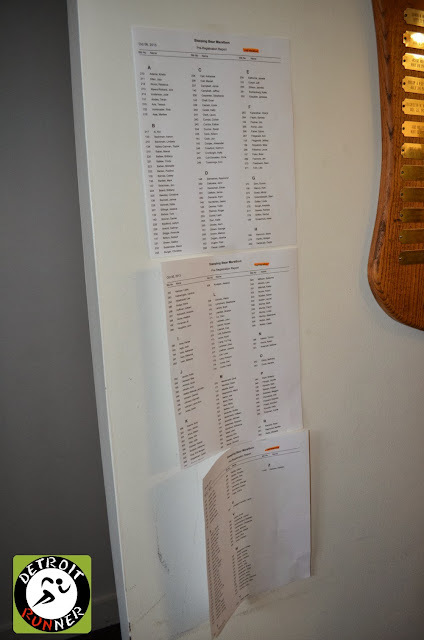 All information was very clear including maps for all locations and a course map. One nice fact is that the race company does not charge any convenience fee to register online so the price you get is the price you get. We drove up to Empire the day before the race in order to pick up our race packets. It was kind of odd that packet pickup was so late in the day starting at 5pm to 8pm. I would guess it was to coincide with the pasta dinner but it would have been nice to pick it up sooner. Since we had time before pickup when we got up there, we toured the Traverse City area and had lunch at North Peak Brewing. You can see there was a little color change but not peak. 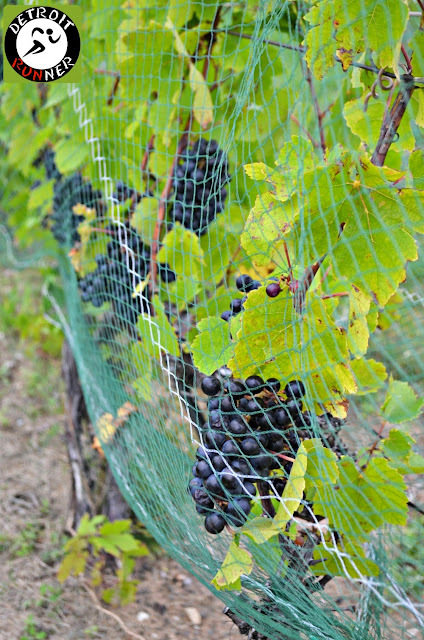 We got some great pictures along with seeing the grapes grow! After Traverse City, we headed to Empire and wanted to see if we could get into the National Park which, of course, was closed thanks to our Federal government. We originally had planned to drive through the park. We could not go into the main entrance to the park, however, someone moved the barricade at the dune climb so we were able to see that. There were about 20 cars there. As you can see below, someone didn't like the decision to close the park. Ha! We were also able to walk into another part of the park where the beach was and get some pictures. I got this cool crane landing on the beach. We also had time to drive the course and were in for a rude awakening. This course is much hillier than we expected but at least we knew what we were up against. 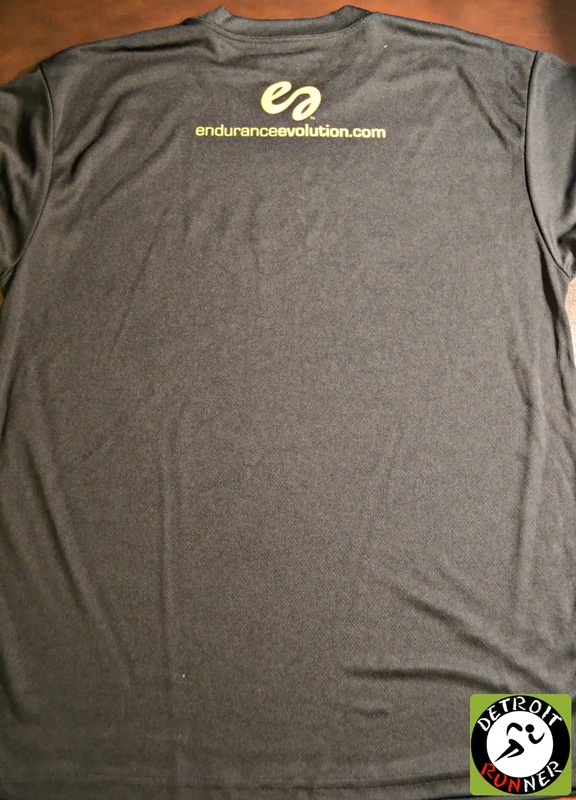 Actually, the race did have the elevation on their website but it does not look as bad until you actually see it. Ha! 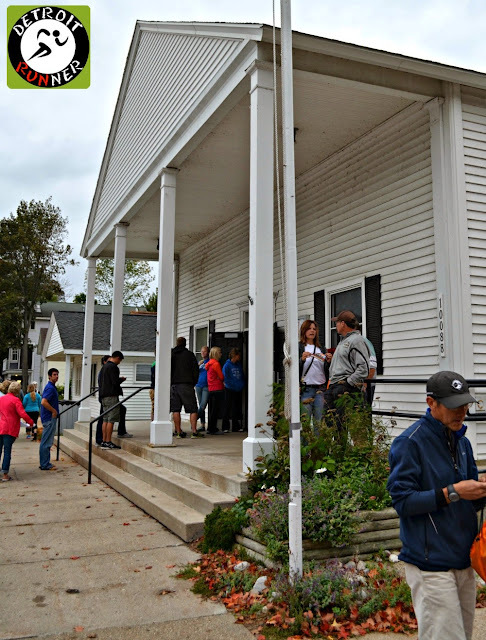 Once we finished touring the area, we headed over to packet pickup. The pickup was located at the Township hall building in Empire. Given this was a smaller race, pickup was quite easy. There were only a few people in line when we got there and we were in and out in a few minutes. The volunteers were organized and had things moving smoothly. The race had bib numbers hanging at the entrance and also were emailed to us as well. You also had an opportunity to purchase race merchandise there if you wanted a shirt or sweatshirt. In addition, you could also eat at the pasta party. There wasn't anyone eating when we were there and we also were not that hungry from lunch so we passed on the pasta dinner and just ate near my cottage. The weather predicted rainy weather all weekend and that it was! It was actually better on Saturday than Sunday so it was just something we just had to deal with. When we got to the start, it was not raining but the threat was there. It was predicted to be wet during the race and unfortunately this time the weatherman was correct. Not that I love to run in the rain, but I'm used to it during training since I always run outside. Kevin also always runs outdoors so he was fine with it. Our running buddy, Trieu, was another story. He was not excited to run in the rain but was a trooper through it all. Trieu - not as happy! Ha! The start area was located at a local park in Empire. We parked a couple blocks away and walked to the start. The race was prepared for the rain and had not only a covered structure but a tent set up as well. As you can see, the main structure had packet pickup before the race too. It's nice to see two options to pick up. While it was encouraged to pick up the day before, given the small size of the race, I would opt to just pick up that day in the future. I don't see any reason to pick up early unless you are staying in Empire or Glen Arbor that weekend anyway. There was plenty of time to pick up and I overheard a volunteer say they were holding all packets until people got there so they didn't run out of shirts for those registered. I was happy to hear that. The race also offered a banana and coffee and hot chocolate prior to the race. While I didn't have any, it was a nice gesture. Almost minutes before the race started, the rain began and it was coming down pretty good. I was standing under this tent and the water was flowing off of it. Fortunately we had enough time to use the restroom and get under the tent without getting wet prior to the start. The race had plenty of port-o-potties at this area as well as on course. The course was an out and back format which I've come to like more and more. Whether you were running the half or full, it was out and back but just longer to turn around. One of the nice things in the out and back of a smaller race is that I was able to count the number of runners ahead of me. At the turn, I was 24th place and I ended in 22nd place. As you can see from the elevation map, there were some hills to contend with! While I've run hilly races, this one had a couple very long hills that went on forever and really taxed your body. If you don't like hills, you won't have fun on this course but I really enjoyed the challenge. 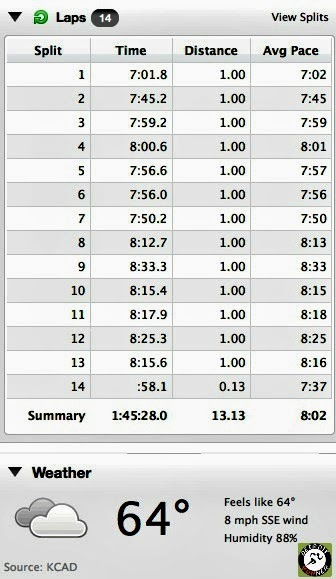 Once again, I went out way too fast, as you can see by my times, and slowly reduced as miles clicked by - oops. I tried to do what I could to keep the same effort on the hills but since they were over a mile long, it was quite tough. In forethought, I probably should not have tried for a PR at this race given the hills. I'm happy that I didn't walk any of the course and it helped me get that third place age group award. For those of you that have run the Brooksie Way half marathon in Rochester, I would say that while the elevation of the Brooksie Way is slightly more, this course seemed a little harder due to the longer, steep hills. I'd also like to say that the weather was absolutely horrible for this race so this is the worst set of pictures I've taken in all my races. I took over 100 pictures on the course and only a couple came out! As we started, the rain was really coming down. While I should have been up near the front, I chose to let some of the crowd go ahead and pass people on the course. After a couple miles, things thinned out quite a bit so it was not an issue. The first mile was somewhat crowded but still was not too bad. As seen in the picture below, the race should have closed this part to cars(at least the first 1/2 mile). The street was just not wide enough for runners and cars. The course was not closed to traffic as we ran on the side of the road which does not really bother me. While it was not bad at the start, we saw several later half marathoners and marathoners coming in that were running around cars and people and it was not fair to the runners. That was the only part on the course that needed better control on course. There was also a section on M-22 where the police helped keep runners safe but otherwise, you needed to watch for traffic most of the course. Given the Sunday morning start hour, there was not many cars to deal with. As you can see, it was a nice run in the country as we passed this cool barn. While you cannot tell, it was still raining at this point. You can also see some of the fall colors pop here and there and, had the trees been at peak color, the course would have probably been one of the most beautiful of the 19 half marathons I've run. Due to the course being open to traffic, there were a few people cheering runners but it was mostly quiet. It was also a smaller race so a big crowd was not expected. The spectators that did come out in the rain were awesome! We also passed by the Dune Climb that we visited the day before which was nice to run by. This was almost at the turn around for the half. Upon turning at the halfway point, we were greeted with views of Glen lake which was beautiful even in the face of the poor weather. It also happen to be one of the few clear pictures I got on the course. A really nice area on the course with the lake by your side. The lake really helped to take your mind off running. As seen above, it continued to rain and, about mile 10.5 for me, the weather took a turn for the worse and it started raining in buckets and the wind picked up. It also didn't help that we had a headwind coming back either. Even in training, I've rarely run in such bad weather and it's the first race that it was that bad but there's nothing you can do but continue running. We were fortunate that it was just rain and not lightning which could have cancelled the race. My feet stayed dry until about mile nine and then there was nothing to do to keep the water out after that so it was necessary to run in water logged shoes the rest of the way. Fortunately I put Bodyglide on my feet so I don't get blisters often and had no issues this day as well. As you can see below, there was also a dirt road section that was also very hilly(sorry - so blurry). As we finished up in the last mile, the weather broke a little and we finished in sprinkles. There were spectators at the finish area cheering us towards the end. There were several aid stations and the volunteers were awesome. Not only was it rainy, the wind picked up and yet they still continued to cheer for the runners. I thought they were awesome to help out in such bad weather. The race offered water, Hammer drinks and also Hammer gels at two aid stations for the half. As you finished, a volunteer put a race medal over your head and congratulated you. I love when volunteers do that instead of just handing it to you - it makes you feel special. The finish area was the same as the start and you were able to immediately get out of the rain. The race had cut up apples, bananas, oranges as well as bagels for the runners. They also had water, Hammer drink and coffee and hot chocolate. I was also able to stretch in the covered area and enjoy a hot cup of coffee as the wind picked up a little as well as temps dipped slightly making it a bit chilly, considering I was soaking wet at the finish. Shortly after I finished the race, the company announced the winners of the marathon and half marathon and allowed those that won in their age group to pick up their award. Overall winners got a plaque and free entry to the following years race and age group awards were glasses with the race information on it. I was lucky enough to get third in my age group and my buddy, Trieu, was able to place second in his and he was only off first place by 1/2 of a second! Since I was soaking wet, I went back to the car and changed out of my soaking wet shirt into a jacket to wait for the awards. Unfortunately I didn't bring a pair of dry shorts but wish that I had. Kevin was the smart one and changed fully after the race. The race took quite a bit longer than we anticipated for the awards but I believe they were waiting on the women's marathon winner to finish to announce all of the winners at the same time. With awards complete, we picked up our awards and headed back to my cottage to get in a warm shower before heading home down state. The three stooges finished with our huge medals! For your registration fee(as low as $55), you received a chip timed course, a tech race shirt and a race medal. You also received a race cinch bag as well as finish line food. While the price was a little higher than some other races, there were no sponsor information on the shirt which is a huge bonus. I won't feel like a walking billboard when wearing the race shirt. Age group awards were glasses with the race information on it. This adds another glass to my race glass collection. Overall organization was good, however, there were a couple areas I felt needed improvement. The first is the traffic control for the first and last half mile(especially the last). They need to at least close the road for the beginning and ending of the race. It's just not wide enough for both runners and cars. The second issue was to not make the winners wait so long for the winner announcement, but, of course, you can't announce until the winners are all in so I understand why they might have delayed. Perhaps they could have had the age group awards ready so people could get on their way. Other than that, the race did an awesome job especially since this was only the second year of the race. It's clear they have done this before given the other races they offer. Overall, this is a race that I would do again. Of course, it would have been nice to have sunny weather, but that's no fault of the race company. The course is a beautiful and challenging course and, if and when, I run this course again, I hope that the fall colors are at peak. The race had great communication, a nice course, good after race food, and an awesome and large finishers medal. It was also at least 13.10 miles which has not been the case for my last few races. 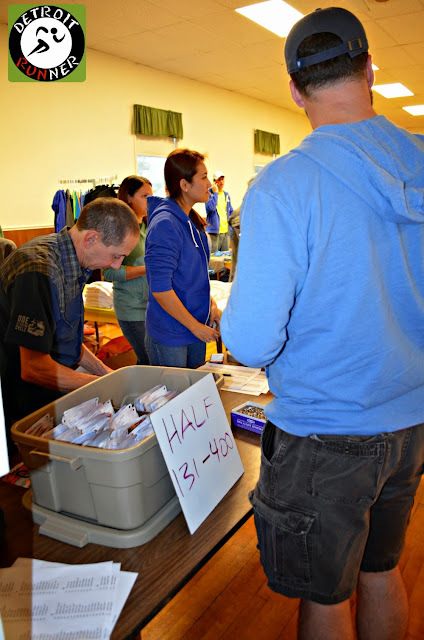 The aid stations were awesome and the volunteers were great and friendly. I love running a smaller race once in awhile since I have a chance to place in my age group. Add some sunny weather, and the day would have been just perfect. I was happy to check off yet another great Michigan half marathon. 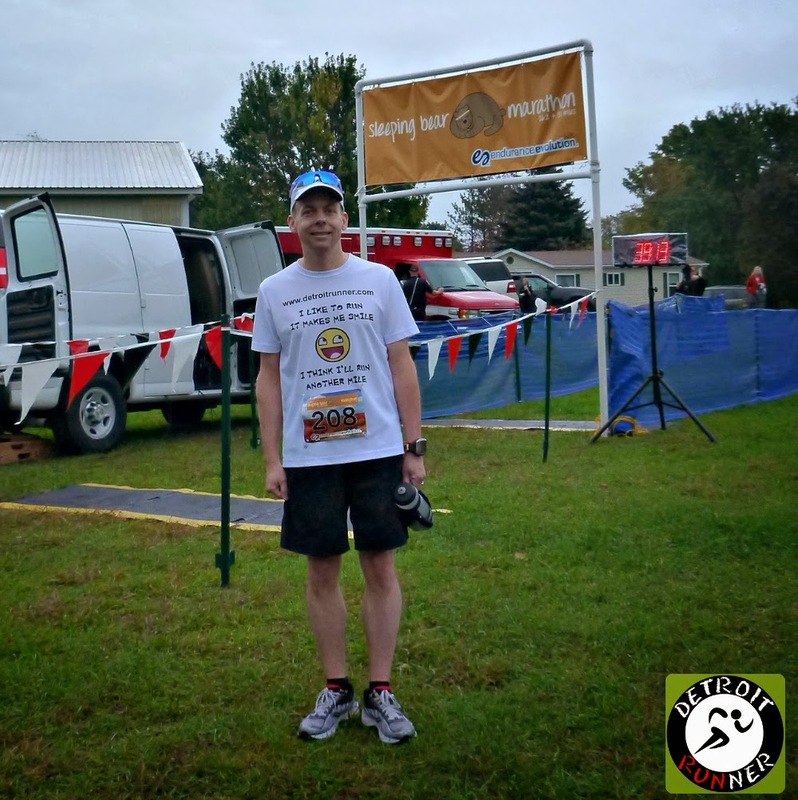 I enjoyed this race enough that I'd like to run Endurance Evolution's Traverse City Trail Running Festival 25k next April and perhaps even their Solstice Half marathon in Glen Arbor in June. Another great recap! Congrats on a strong finish and for placing! Way to go Jeff!! I see you splits are getting better and better, I think you are getting stronger and stronger, let's hope there are good things to come. 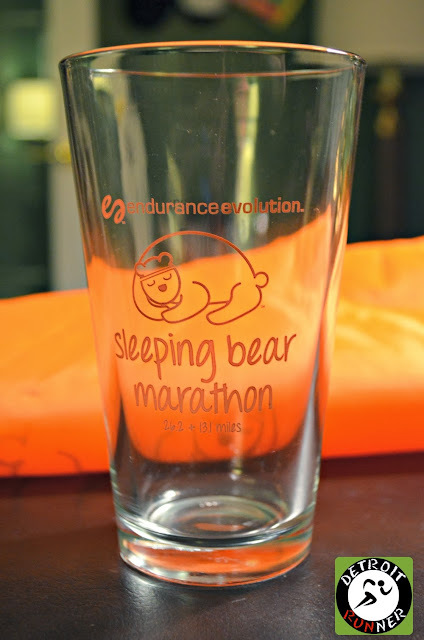 The Summer Solstice race is one of my favorites by Endurance Evolution. I did this one last year and really liked it too! Great run and awesome result for you, well done! Looks like a really beautiful course. Dune climbing...nice! Nice bling as well. Great recap--congratulations on your race! I volunteered race day (packet pickup) and also cheered on runners at various spots on the course. The weather definitely was tough. Way to go running in the rain, and also on those hills. I am hoping to run the half next year. I've run the trail race in April--I recommend it! They do put on awesome races. Congrats on your age group win! This is on my bucket list because this area is my favorite place in Michigan. Good to know about the hills... I would have to go into this not expecting to PR. Do love those medals! This is a little late but congrats! 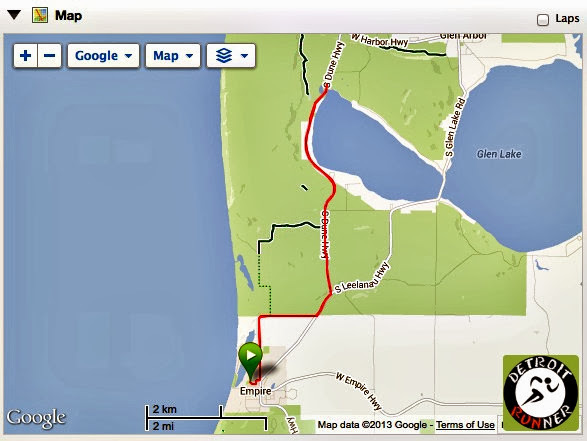 I am interested in doing the Sleeping Bear Dunes Marathon this year (2014) because the area is so beautiful but I was on the fence because it is a newer race. Because of your review, I think I will go for it! So thank you!